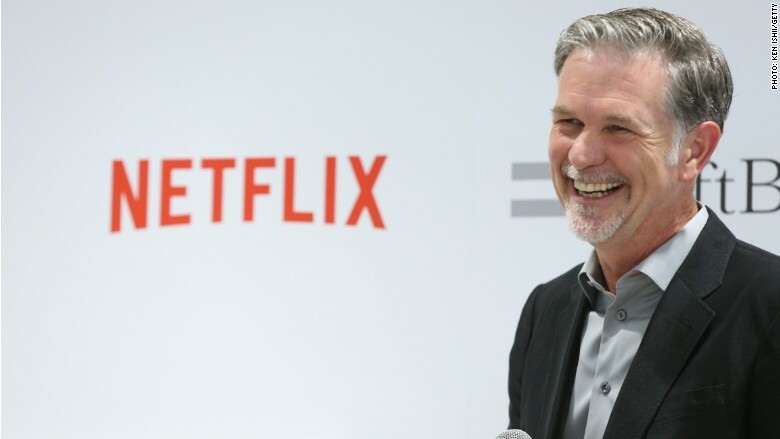 Netflix plans to shower CEO Reed Hastings with even more stock options next year. According to a public filing issued Thursday, Hastings, who co-founded Netflix (NFLX), is due to receive $28.7 million worth of stock options in 2018 on top of his $700,000 base salary. Over the past few years, Hastings has seen his annual salary dip slightly in favor of a significant hike in his stock options, public filings show. In 2016, Hastings was given a $900,000 base salary and $19.1 million in stock options. This year, his base salary was slashed to $850,000 but he was slated to receive $21.2 million in stock options. Hastings is already extremely wealthy. He broke onto the exclusive Forbes 400 list of richest Americans this year, cinching the 359th spot with his $2.2 billion fortune. The California-based tech entrepreneur founded Netflix as a DVD-delivery company in the late 90s, and the firm successfully morphed into a video streaming powerhouse as DVDs became outdated. And Netflix is showing no signs of slowing down. The company's stock is up more than 55% in 2017. It's a common practice throughout corporate America to compensate employees with stock options. And it's part of what has driven CEO compensation to astronomical highs over the past couple of decades. Stock options allow a person to buy or sell company shares at a pre-determined price at some point in the future. When it comes to using stock options as corporate compensation, the recipient usually gets a "buy" option for whatever the market price is at that time. The thinking goes that C-suite executives will be encouraged to please investors, and thus drive the company's stock price higher, so their options will become more valuable. If the company's stock tanks, however, these options can become virtually worthless.